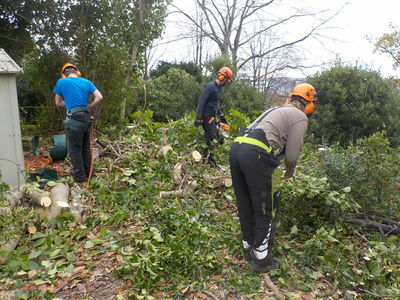 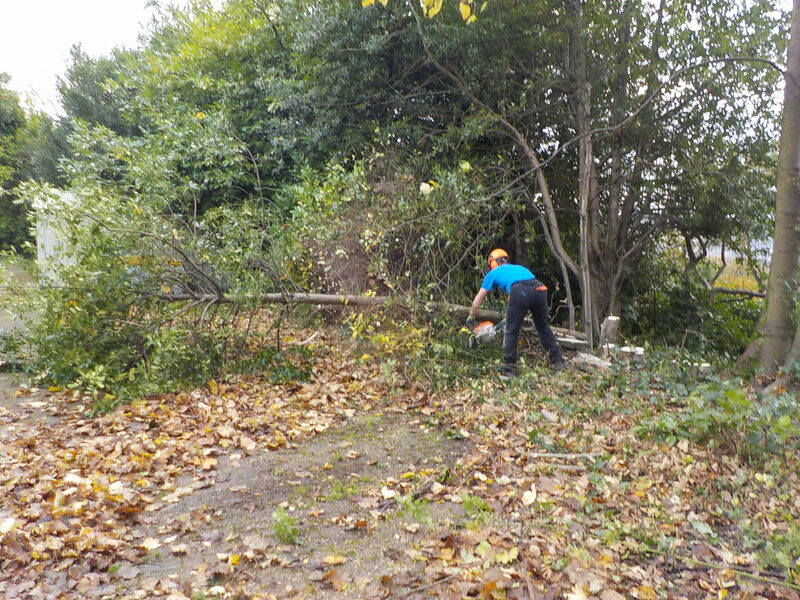 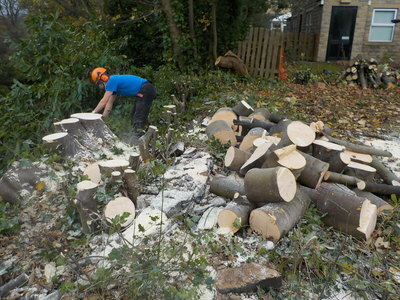 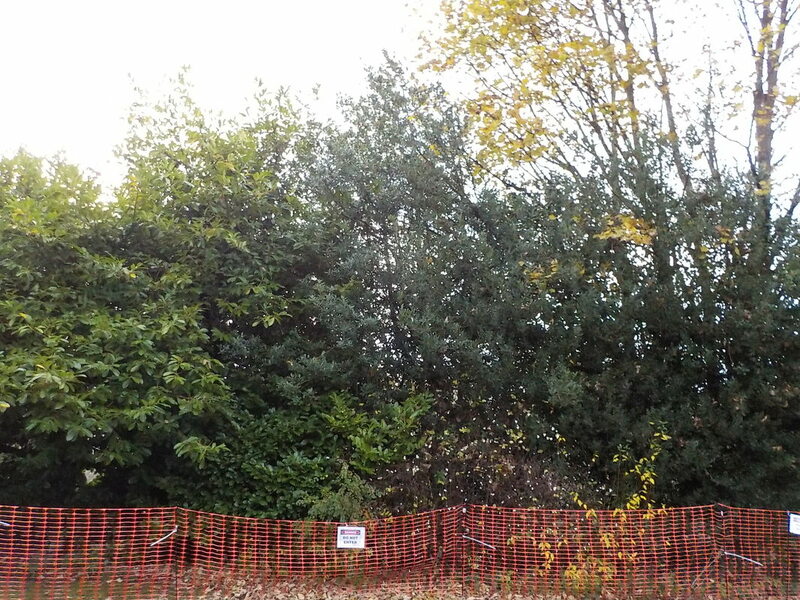 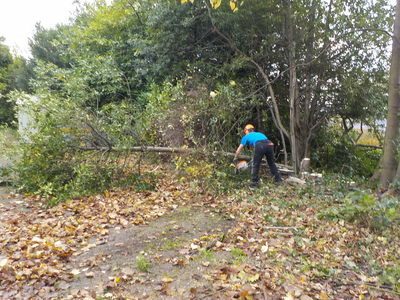 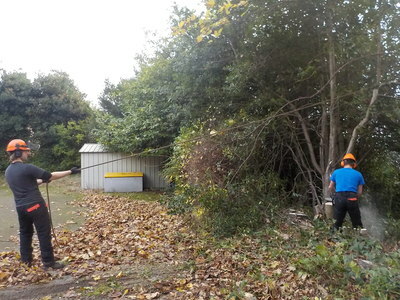 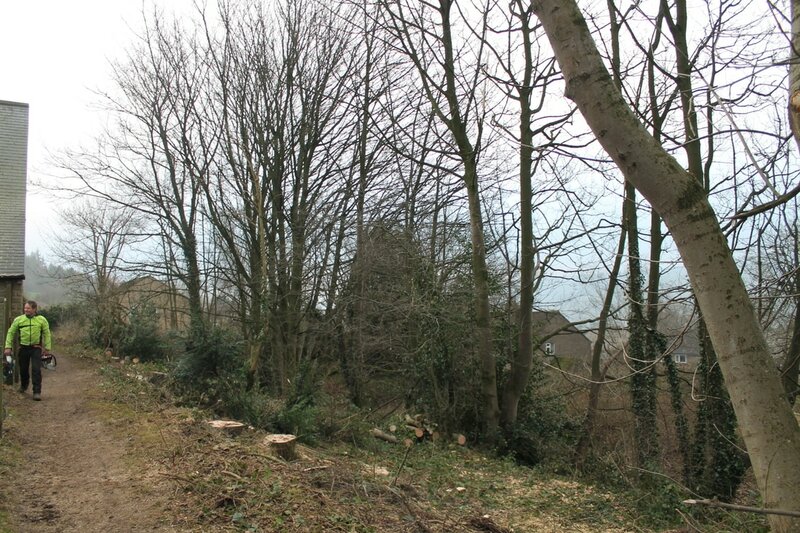 Our team can safely undertake felling and removal of overgrown areas that either need to be reclaimed or have become unsafe. 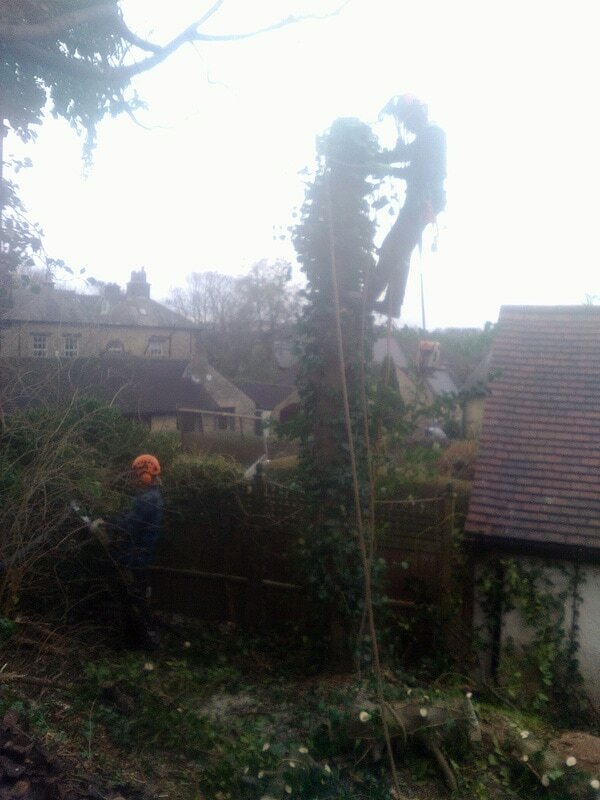 Old hedges can become outgrown or neglected gardens can become a jungle. We can also follow up with the clearance of weeds. Old hedges can grow out to the point where they are a dense line of trees that are difficult to manage. 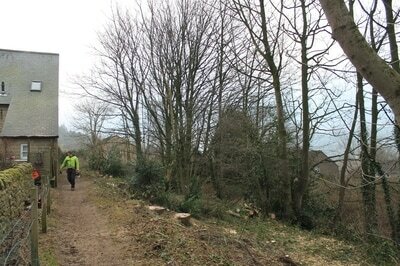 In this job in central Sheffield, they were also disguising a steep drop behind. 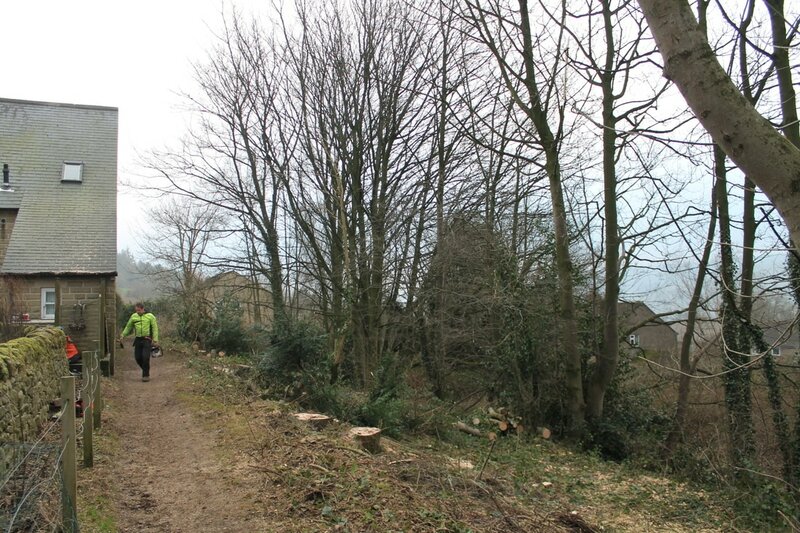 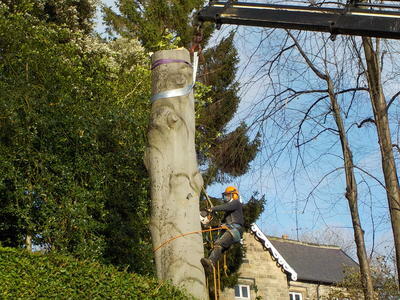 By removing, it allows the boundary to be re-assessed, re-planted and easily maintained. 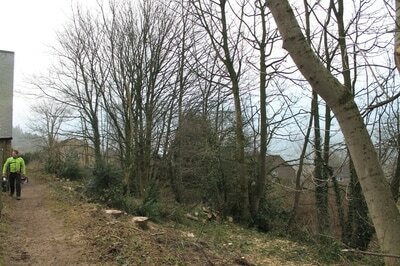 In this case several ash were overshadowing a track and buildings creating a potential future problems. 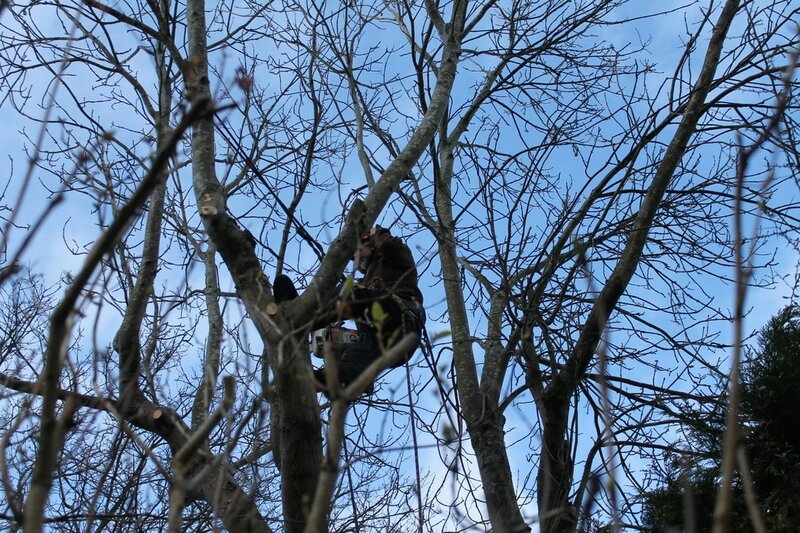 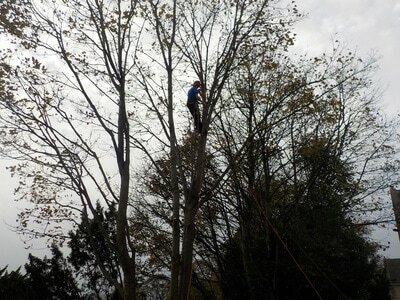 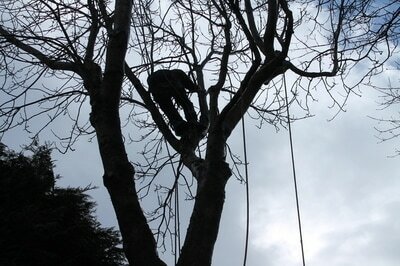 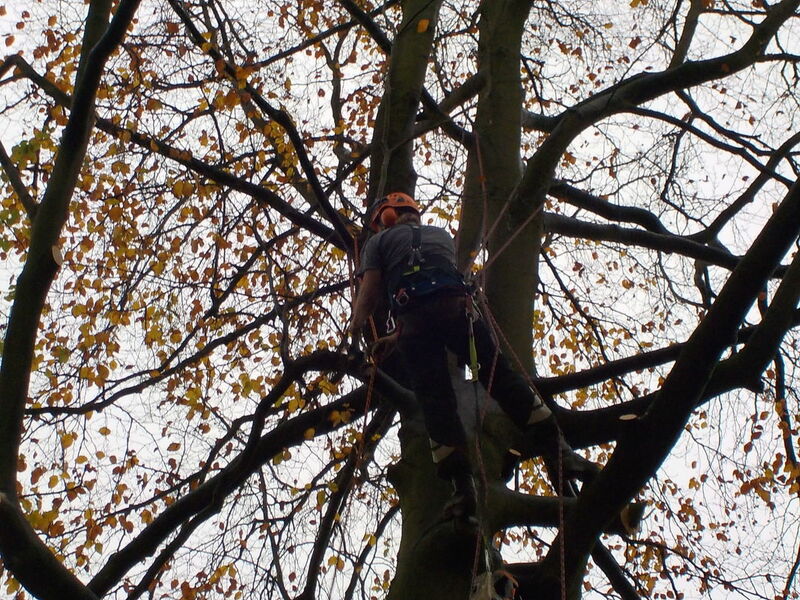 By climbing each tree and lowering the branches in small pieces, the issue was resolved. 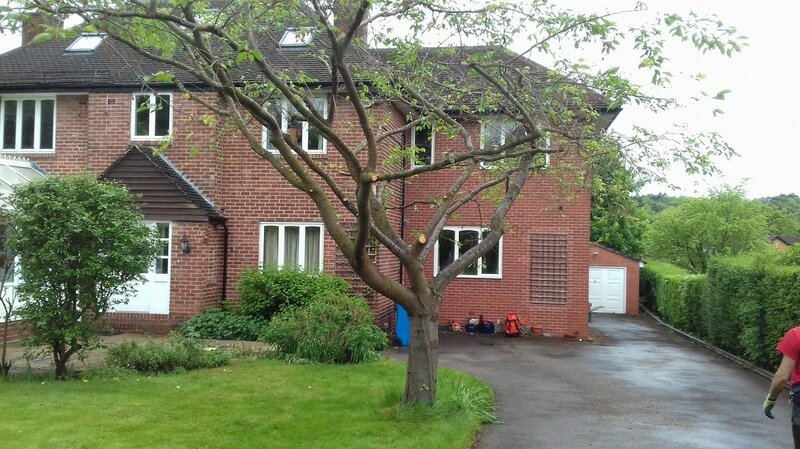 In some scenarios a tree may have grown in the wrong spot as a self-set or simply grown too large for where it was originally planted. 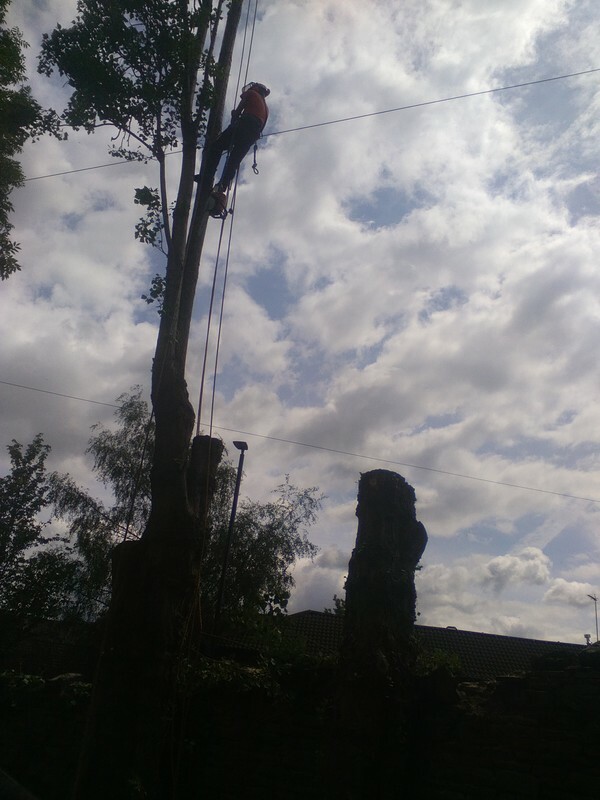 In this case, two poplar trees were pushing down a mortared wall and growing into utility cables so the trees had to be removed in order for the wall to be re-built. 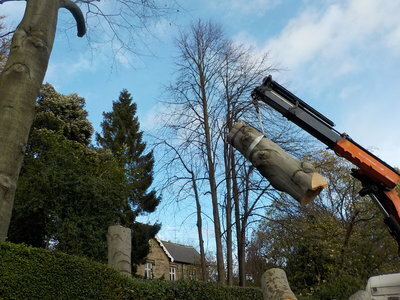 The trees had to be carefully dismantled. 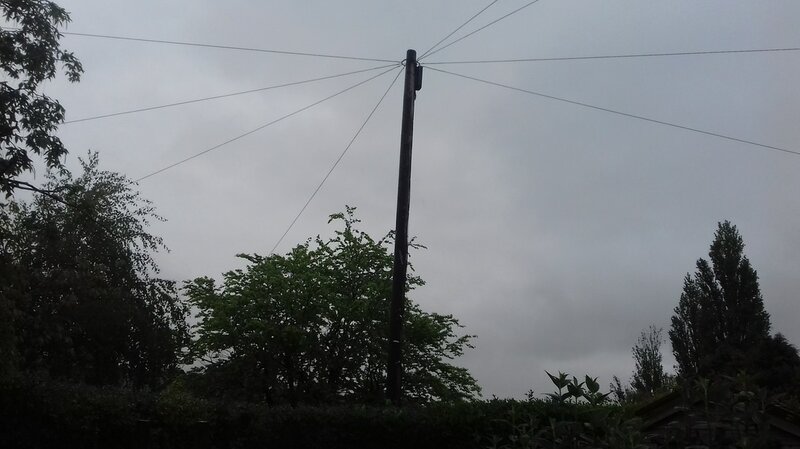 This sycamore was growing right into the telegraph pole and wires in the corner of a garden and it was decided that it was best to remove the tree as it was in the wrong place. 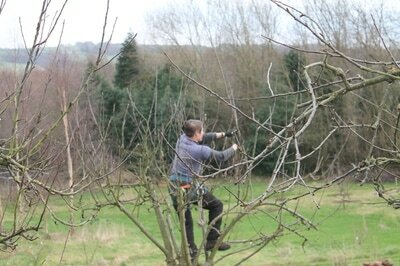 If it was left to long the branches could cause disruption to the line or eventually damage the wires. 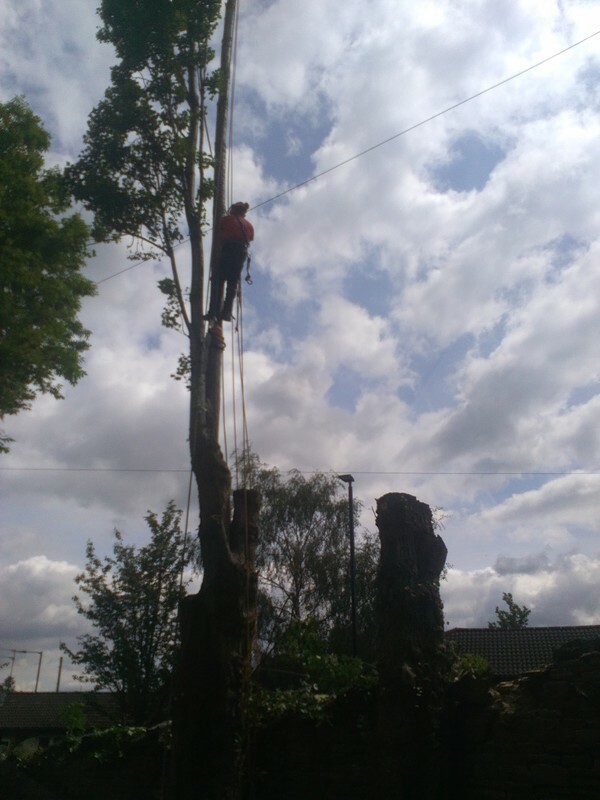 Often dead trees can fall and become lodged in other trees. 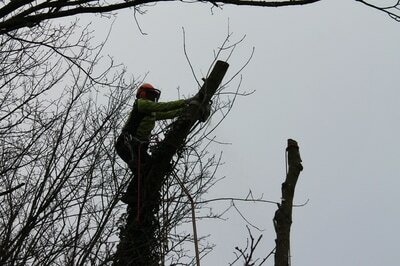 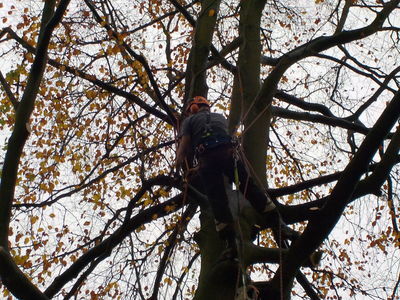 By climbing the tree it had fallen into, this dead birch could be carefully lowered down without damage by our climber. 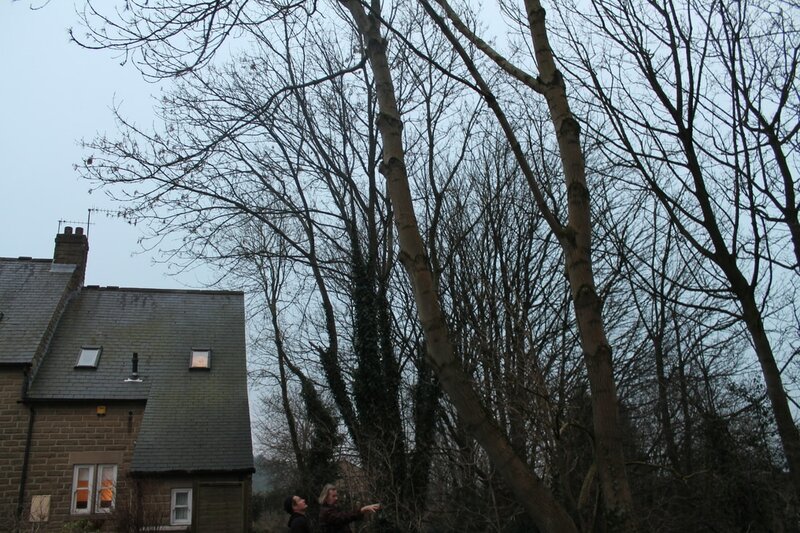 Here, we also reduced several hollies to a new height of 6ft so that they would form more manageable bushes. 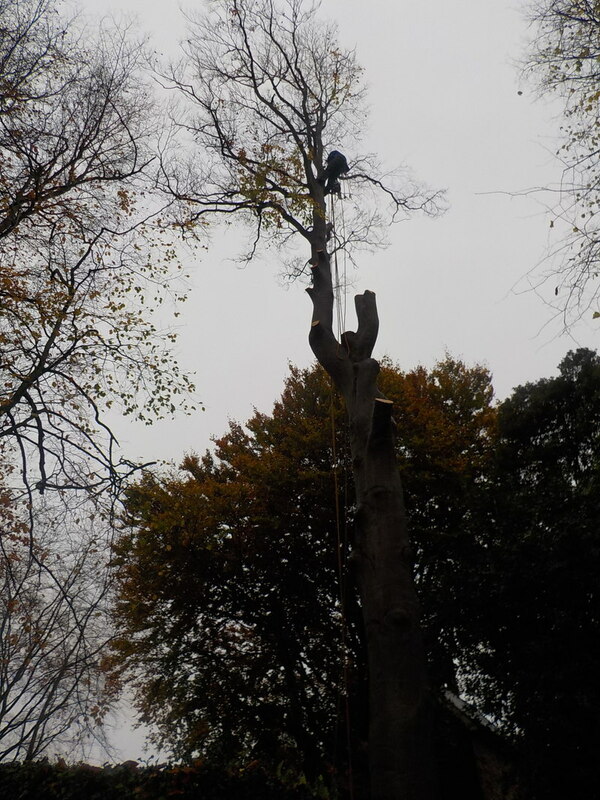 This beech (fagus sylvatica) had rot through its centre and had to be taken down. 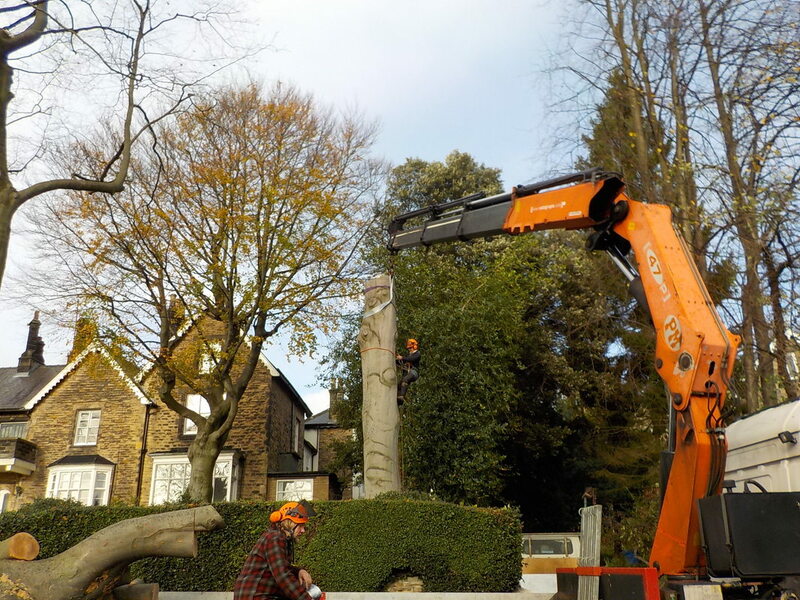 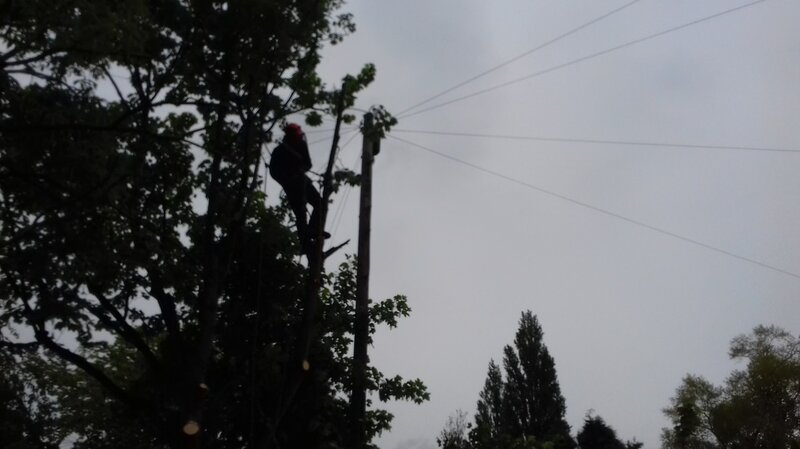 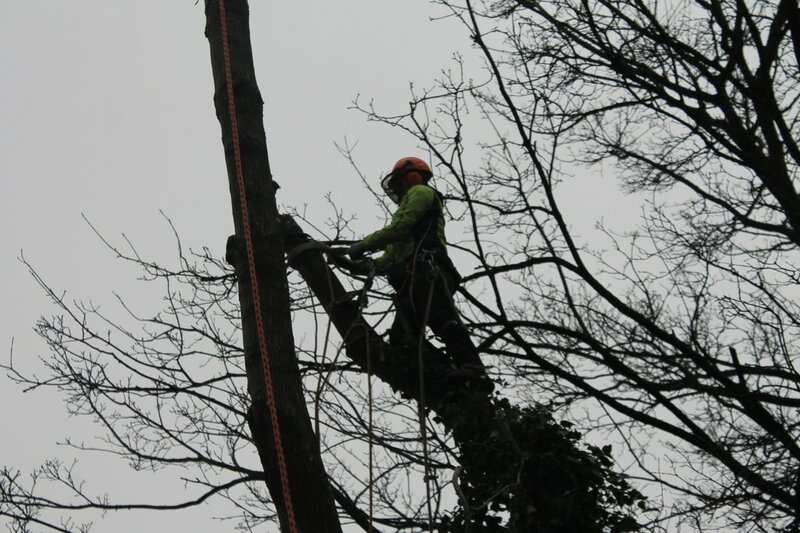 Although this was a difficult task in a busy borough, our team undertook it efficiently and the use of a large hiab crane to remove the stem in large trunks increased speed. In the case of this job, large spreading branches of the ash posed a potential threat to a building at the base of the tree. 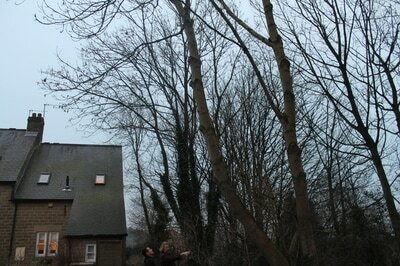 It had to be carefully dismantled and lowered gently bit by bit using rope and flying capstan. In the case of this job there was no access to the road so the branches and stem were processed and left in situ. Pruning work may be undertaken for various reasons, for instance thinning out or raising a tree's crown may improve its appearance. Thinning out a dense canopy may also allow more light into a garden and reduce a tree's wind resistance if that is a concern. Pruning may also improve the health of a tree depending on the species and time of year. 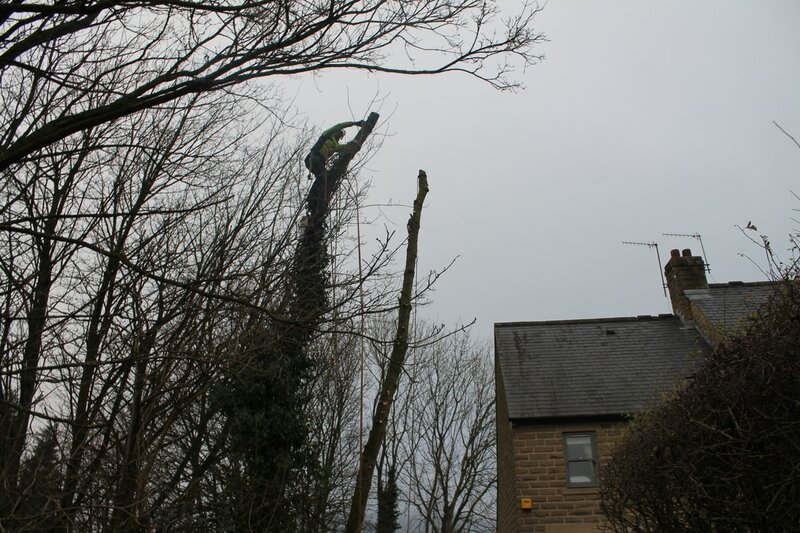 However, pruning may also be necessary for other reasons if the tree's spread needs to be reduced because it threatens buildings or cables for instance. 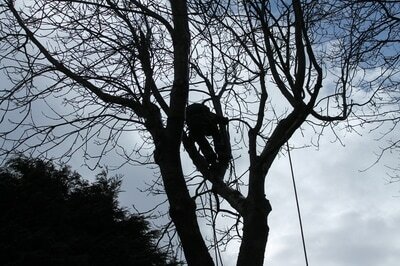 Certain branches may also have to be taken off if they are dead or damaged and loose, causing a safety issue. By removing a percentage of the branches in a trees canopy the garden below can be brightened by the tree allowing through dappled light. 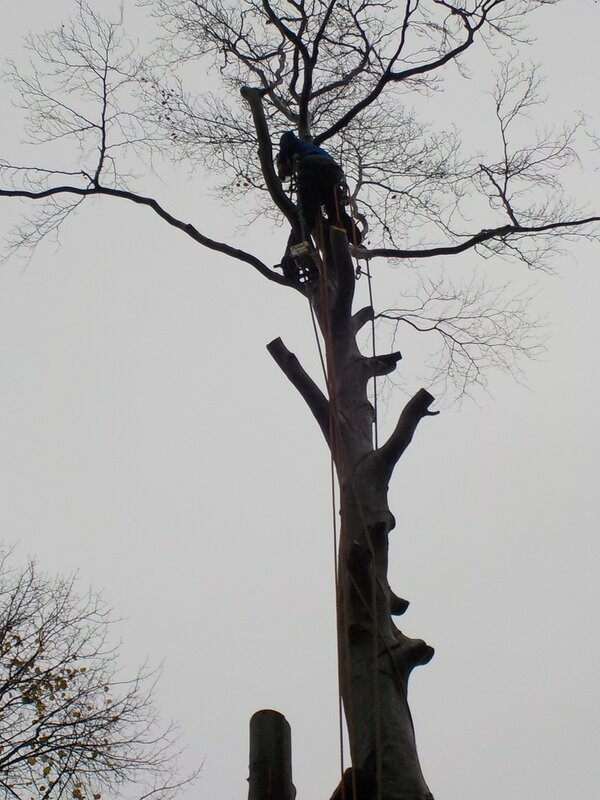 It might have been tempting cut the top off the tree but this can result in the tree sending up a mass of dense growth and casting even more shade. 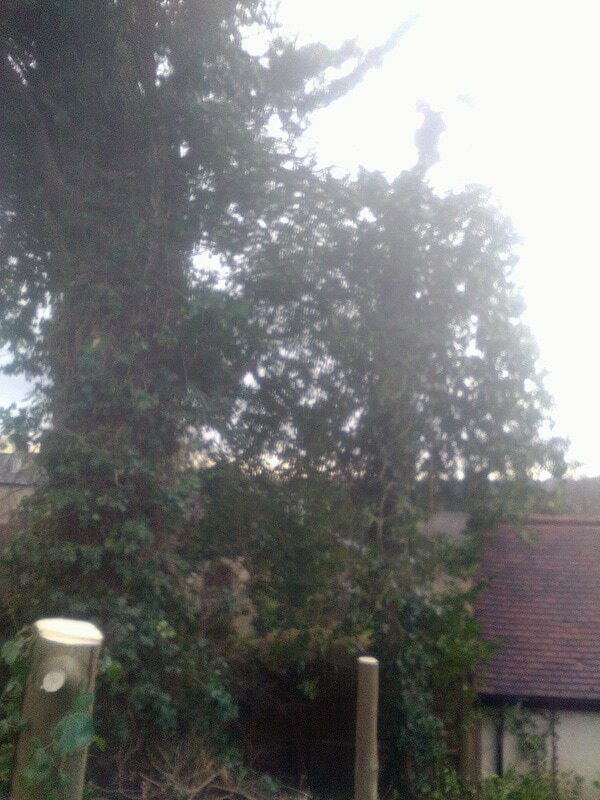 Here branches extending towards the neighbour house have been removed preventing future problems. Fast-growing smaller trees like pioneer species such as silver birch have a relatively short lifetime and after a few years can become to large for their situation. 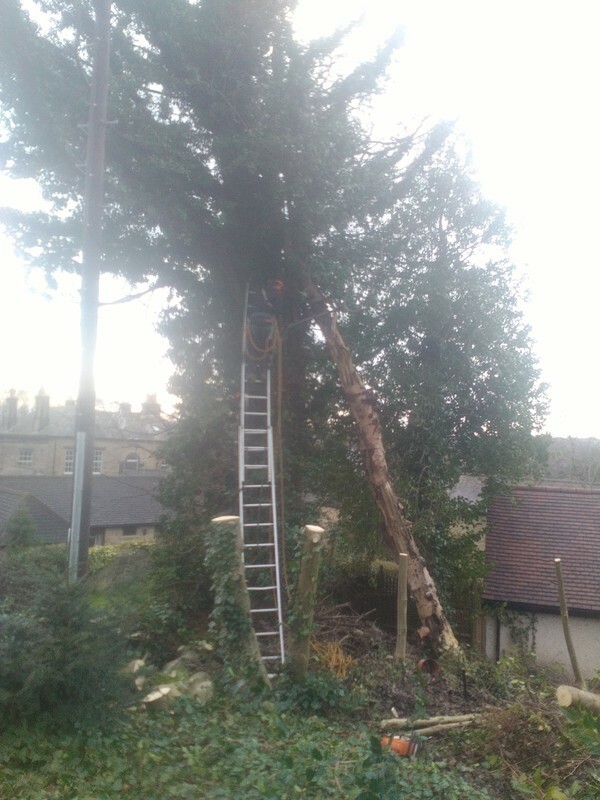 Other common fast growing species include sycamore, poplar and particularly conifers such as the varieties of garden cypress or a Norway spruce can quickley put on density and mass and become unmanageable or dry out the surrounding soil. 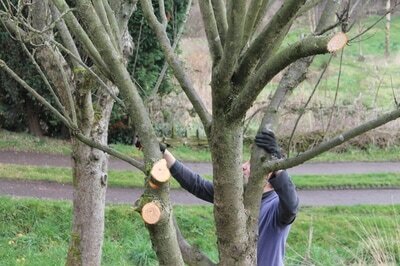 Often the best solution is to remove rather than try to cut back and re-plant. 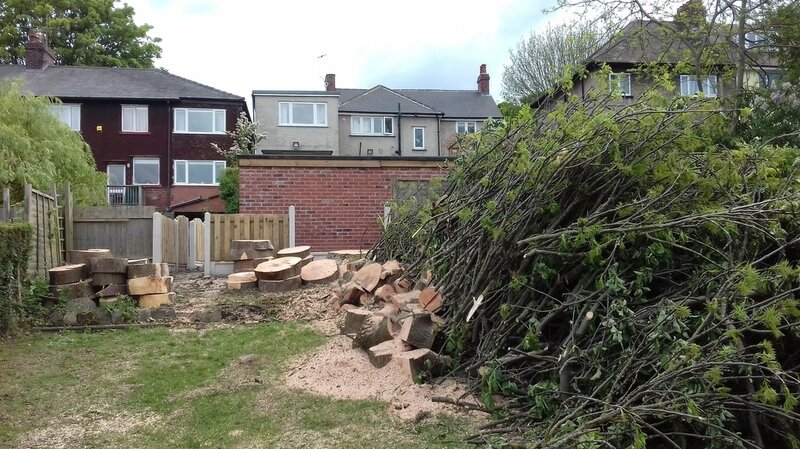 In this situation a Silver Birch (Betula Pendula) had been planted in an enclosed back garden but had gotten to large for the aspect. 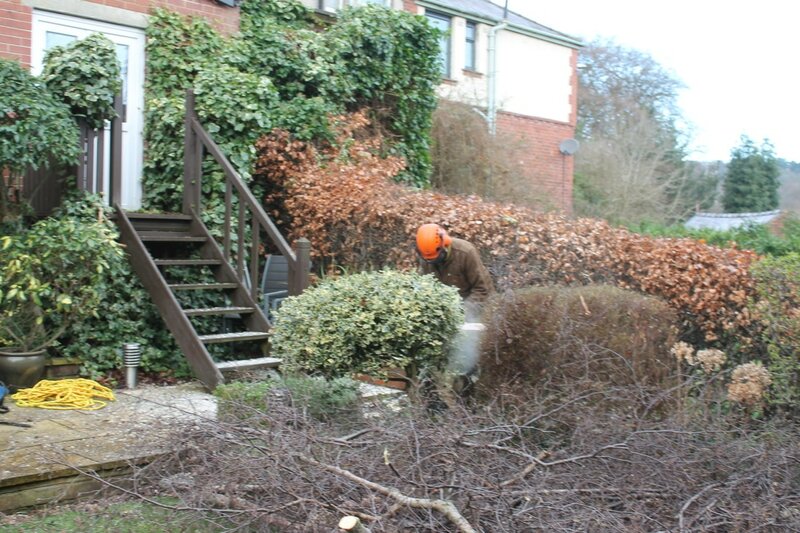 The Birch was carefully dismantled before being carried out of the garden in small pieces to minimise damage to plants and garden furniture. 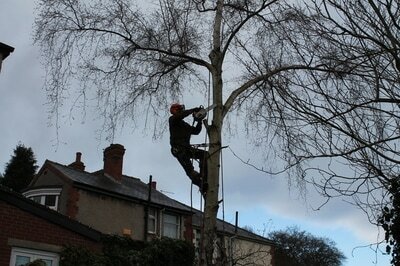 Silver Birch are a relatively fast growing but short lived tree . 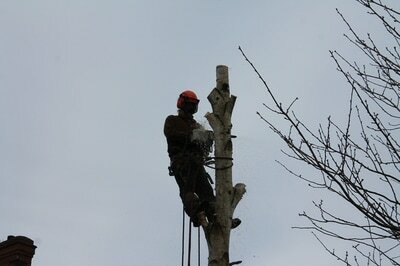 A new Birch is to be planted and will quickly start to fill the space.